Note: MobileGo for iOS (Mac) is renamed as TunesGo (Mac). You can't depend on iTunes to rebuild your iTunes Library or backup music, videos, photos, voice memos, etc. to your Mac. It simply can't do it. 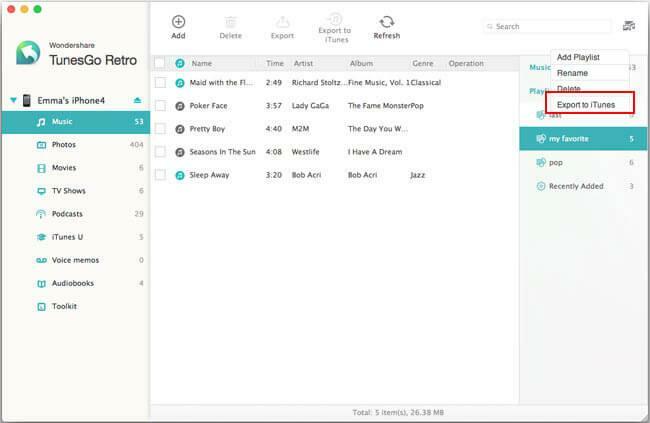 Instead, you need a transfer software tool like Wondershare TunesGo (Mac). It's a professional iPhone/iPod/iPad manager for Mac. It not only does what iTunes can do: transfer music, videos and photos to iPhone/iPod/iPad, but also does what iTunes can't do: let you copy iPhone/iPod/iPad music and playlists (smart playlists included) to your iTunes Library with ratings, play counts & skips or backup videos, photos, voice memos, Podcasts and more to your Mac. Now, you'll no longer worry about issues when managing your songs, photos, and video. Whether you've bought a new Mac computer or lost music from your iTunes Library, now with Wondershare TunesGo (Mac), you can export all music and playlists on your iPhone, iPad and iPod touch/classic/shuffle/nano to your iTunes Library on Mac with ratings, play counts & skips. What's more, this feature never duplicates any song or playlist you've had on iTunes Library. That means it only exports songs and playlists you don't already have on your iTunes Library from iPhone, iPad, iPod touch/nano/shuffle/classic to your iTunes Library. Note: "Smart Export to iTunes" is different from "Export to iTunes". By default, "Smart Export to iTunes" lets you export all music on your iDevice (iPhone, iPod touch/nano/shuffle/classic, or iPad) to iTunes Library filtering out the ones already in your iTunes Library. "Export to iTunes" means it only transfers the songs you've selected on your iDevice to iTunes Library on Mac. Want to backup some songs and videos on iPhone, iPod touch, or iPad to your Mac’s hard drive? Or have you taken so many photos with your iPhone, you need to copy them on Mac for further editing? 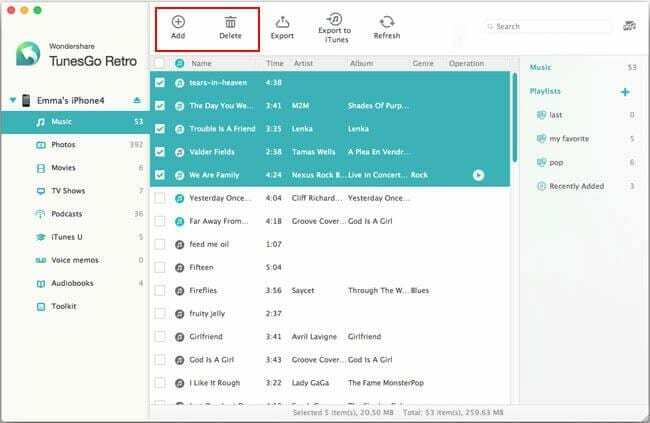 With Wondershare TunesGo (Mac), simply select the music, videos, or photos on iPhone, iPod touch and iPad that you want and click "Export to Mac" to transfer them to iMac, MacBook Pro or MacBook Air. Now, Wondershare TunesGo (Mac) lets you transfer music and playlists with full info from iPod shuffle/nano/classic to Mac. • Transfer music, Podcasts, iTunes U, audiobook, and voice memos to Mac. • Transfer movies, TV shows, music videos, etc. to Mac. • Export Camera Roll and photo albums to Mac. Have some killer songs & video, but can’t transfer any of them to iPhone, iPod touch, or iPad for play? Keep your shirt on. Let TunesGo (Mac) do it for you. Whenever you drag an incompatible file to iPhone, iPod touch, or iPad via TunesGo (Mac), it will convert the file properly for you. And it never wipes out the original files on your device. What’s more, it transfers photos from Mac to iPhone/iPod touch/iPad as well. • Convert audio files in AC3, AMR, APE, FLAC, MKA, MP2, OGG, WMA, to MP3 for iPhone, iPod touch and iPad. • Convert videos in AVI, FLV, 3GP, MPG, 3GPP, 3G2, TP, TS, TRP, MTS, M2TS, DV, MKV, MOD, WMV, ASF, F4V, DAT, NSV, VOB, RMVB, DivX and more to M4V for iPhone, iPod touch and iPad. Wondershare TunesGo (Mac) is a total iPod touch, iPhone, & iPad manager. Use it to manage music, videos, photos, and albums, just about any media file, on iPhone, iPod touch, and iPad easily and efficiently. • Transfer music and playlists on iPhone, iPod touch, and iPad directly to your iTunes Library with ratings, play counts & skips. • Transfer music, videos, photos, and albums to your Mac for backup. • Create new playlists on iPhone, iPod touch, and iPad with drag-n-drop. • Simply click to add media files from Mac or delete files from your iDevices. • Build albums by dragging and dropping photos from your Camera Roll or Photo Library. After you connect iPod touch/nano/shuffle/classic, iPhone or iPad to your Mac and launch TunesGo (Mac), Click "To iTunes" at the bottom of the window. And then you can see a new window pops up, telling you that all songs and playlists missing from your iTunes Library will be transferred to your iTunes Library with ratings and play counts. Click "Start" to begin the transferring process. 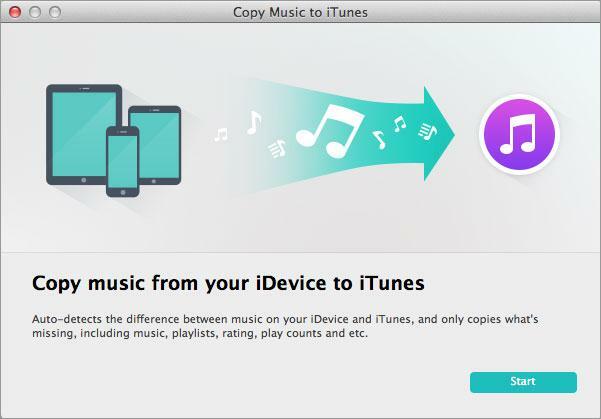 This is the quickest way to copy music and playlists from your iPhone, iPod touch/nano/shuffle/classic, and iPad to your iTunes Library on Mac. 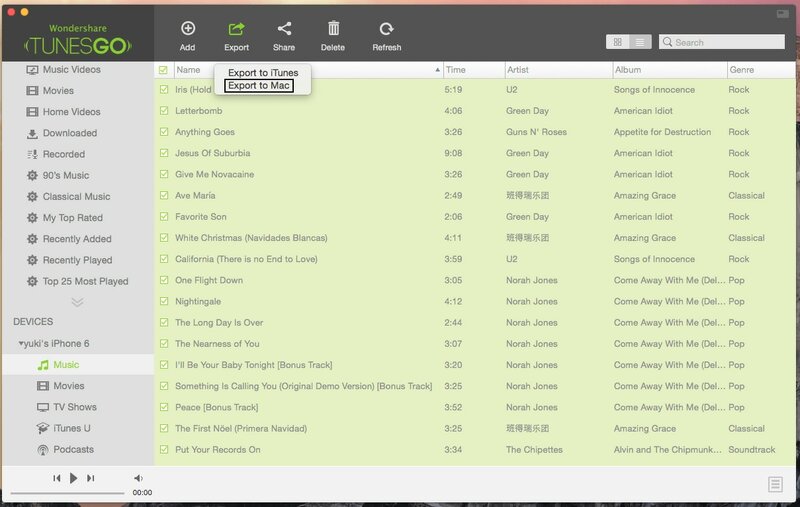 Besides, you can also choose to copy music and playlists to your iTunes Library in the "Music" window. To learn more, read the following infomation. After clicking "Music" on the left side of the main window, by default, you'll see the "Music" window. From here, you can see the option "Smart Export to iTunes". Click it and then you'll see that all songs except these which are already in your iTunes Library are transferred to your iTunes Library on Mac. Also, you can select songs you need and click "Export to iTunes" to export them to your iTunes Library. If you're going to copy some playlists from your iPhone, iPod touch/nano/shuffle/classic, or iPad to iTunes Library, please click "Music" on the left side of the main window. And then you can see playlists on listed from the right side of the popped up window. Right click on the playlist you need and select "Export to iTunes". Note: Now, you can transfer music and playlists from iPod nano/classic/shuffle/touch to iTunes/Mac without a hitch. In the above section, we've introduced how to export all the songs on an iOS device to iTunes Library. However, sometimes, you might need to transfer some selected songs from your iPhone/iPod touch/nano/shuffle/classic/iPad to iTunes or your Mac. In this case, you should follow the tips below to do it. 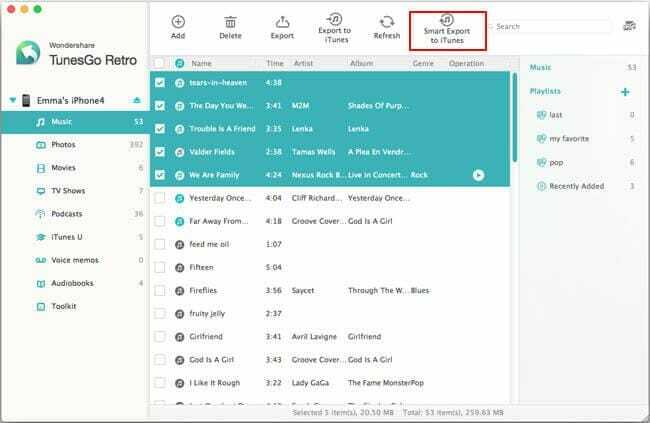 • To transfer iPhone, iPod nano/shuffle/classic/touch or iPad music to Mac or iTunes Library, click Music in the left column of the main window to enter the Music window. Here all audio files are displayed by category. To transfer music, click Music on the right side of window. Then you can see all music files are listed in the left pane. Select the songs you want and click "Export to Mac" or "Export to iTunes". It's the same to transfer Podcasts, iTunes U, audiobooks and voice memos too. Note: In the songs list, you might see iTunes icons. If an iTunes icon appears in front of a song, it means TunesGo (Mac) has detected that this song has already existed on both your device and iTunes Library. If so, you don't need to transfer it to your iTunes Library. • To transfer iPod touch, iPhone, and iPad photos to Mac, click Photo in the left column and you'll see all the photos presently on your device. In the right column, click Camera Roll or Photo Library to reveal the photos contained in those two spots. Click to select the photos you want to export to Mac, and then click "Export" at the top of the main window. If you want to export a whole photo album to your Mac, right-click the album name in the right column. Select "Export" in the pop-up list. • To transfer videos to your Mac, click Videos in the left column. Then in the right side of the Video window, you'll see all your videos sorted by category: Movies, Podcasts, iTunes U, TV Shows, and Music Videos. Click the video type, then find the video you wish to transfer to Mac computer on the left pane. Click Export at the top of the window. It's very easy to transfer music/videos/images from Mac computer to iPhone/iPod touch/iPad. Click Music, Videos, or Photos in the left column. Then click Add at the top. In the window that appears, browse your Mac for the files you want to add to your iPhone, iPod touch or iPad. After finding them, click Open to add them to your iOS device. 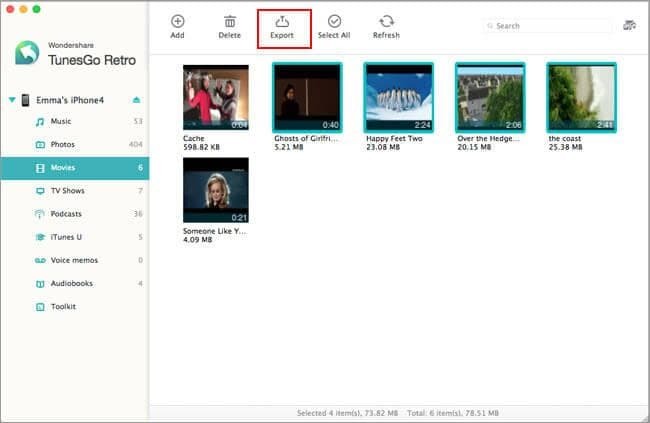 Tips: You can also click Media Browse, then click Audio, Image or Movies to find your files. Select the songs, videos, or images you want and drag them to the left window. That's it. With TunesGo (Mac), files on your device will never be overwritten when new files are added. 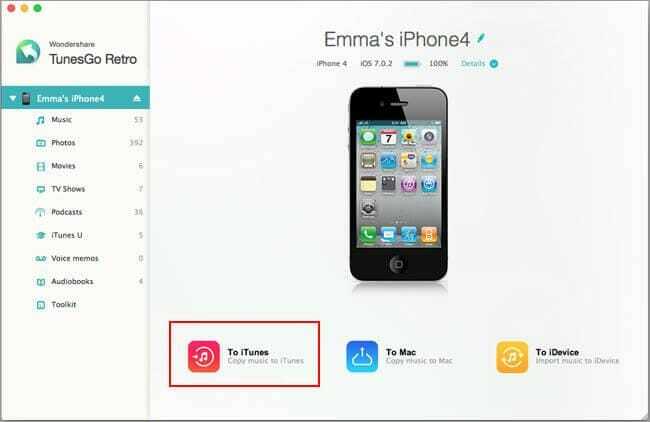 TunesGo (Mac) enables you to convert incompatible files to iPhone, iPod touch and iPad friendly formats. When you drag the incompatible music or videos to your device via TunesGo (Mac), a window will pop up, asking you to convert the files. You should click Convert to begin the format conversion. After conversion is finished, click Add to import the files to your device. Wondershare TunesGo (Mac) is a professional iPhone/iPod touch/ iPad manager. It enables you to manage audio files, videos, and photos on iPhone, iPod touch and iPad easily and efficiently. • Manage audio files. Click Music in the left column to enter the audio file window. From right side of the window, you'll see the Type for audio files and playlists. In the Type list, select any of the type for audio files. In the left pane, you can see all the files for this type. Select one and click Delete. In the Playlist area, you can create new playlist by clicking "Add Playlist". And then drag audio files from the left pane to the playlist. 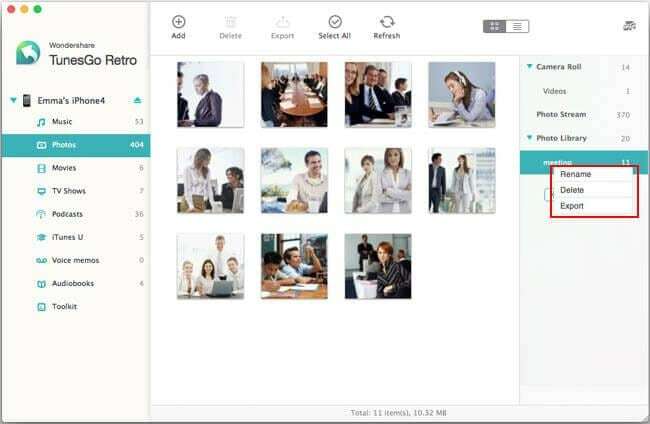 • Manage photos and photo albums. Click Photos in the left column of the main window to bring out the window to photos. Then from the right pane, you can see all photos are in two places: Camera Roll and Photo Library. Select any photo, you can click the delete button to delete it. 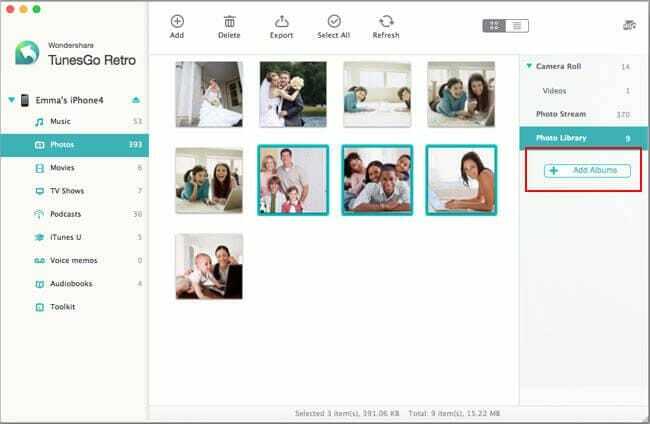 To create a new photo album, click "Add Albums". Then name the album and drag pictures from the left pane to the album. • Manage videos. Movies, TV Shows, iTunes U, etc. are listed on the left. You can click the corresponding video to enter the editing window. From here, you can add, delete or export videos.